Following is a short video of the children we sponsor. It contrasts video taken during the original 2012 documentary team visit versus video taken during Laurent Muvunyi's 2017 visit. Forty-four of our fifty-one sponsored kids were able to attend the special event and thirty-nine appear in this video. All forty-four of the children who attended wrote thank you notes to their sponsors and the seven unable to attend subsequently wrote thank you notes. All thank you notes are being distributed during this year's sponsorship renewal process. 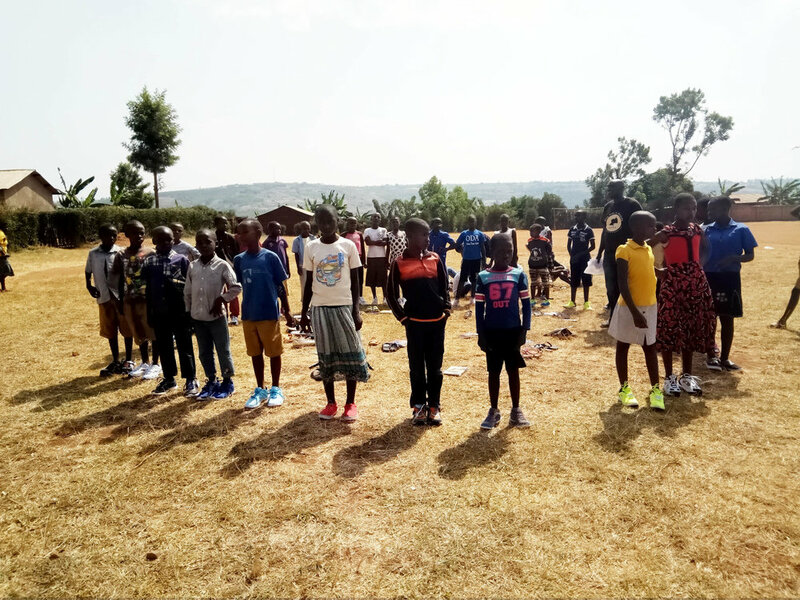 This was a big event in the lives of our children, as noted in earlier blogs below, because the kids received new athletic shoes, enjoyed a big meal, played games throughout the day and took time to thank their sponsors. 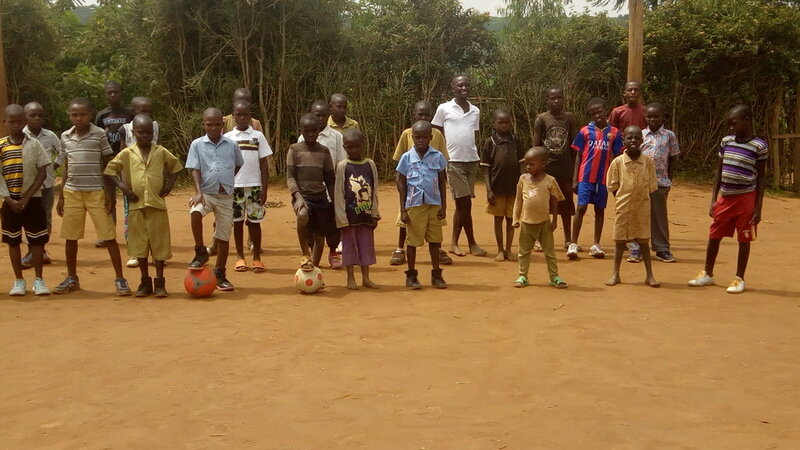 It is great to see how the kids have grown and flourished as a result of your support! Providing Christmas dinner to the children of ARDR in Rwamagana provides their biggest and most nutritious meal of the year as mentioned in previous posts...and 2017 was no exception. The day was filled with great food and fun activities which were organized by the ARDR staff with special assistance from Kelly, Kevin and Cheney, the children of Jean Munyurangabo (ARDR's Executive Director). Activities after the meal included handball, jump rope and soccer. This year's feast and day of fun was made possible for the second year in a row by our anonymous donor. 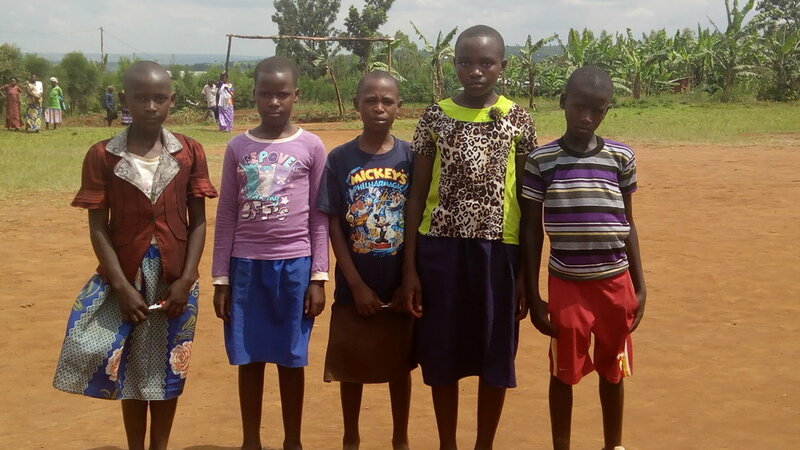 Rarely do the children of Rwamagana, Rwanda wear real shoes. In most cases they wear flip-flops or plastic rain boots. 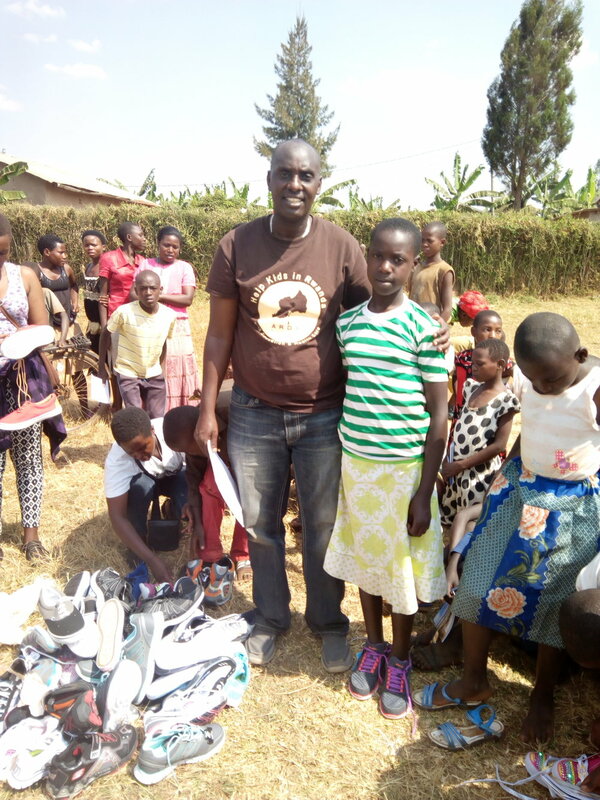 So imagine the excitement when Laurent Muvunyi, ARDR Allies President, delivered 51 new pairs of athletic shoes to our sponsored children of ARDR during his July 2017 visit. The shoes were donated by Shoes 4 the Shoeless, a Dayton, Ohio non-profit organization which was founded in 2010 and has delivered well over 50,000 pairs of socks and shoes to disadvantaged children within the Dayton, Ohio region. Shoes 4 the Shoeless was excited to provide socks and shoes to ARDR Allies after Laurent contacted them for assistance. However, the cost of shipping shoes overseas is extremely cost prohibitive. Therefore, Laurent and Ken got their heads together and decided to pay for extra airline baggage and pack the socks and shoes into a large suitcase and duffel bag which Laurent could take on his trip to Rwanda. After a couple of hours of cramming and nesting the smaller shoes into the larger shoes the shoes were packed and ready to go. Thank you Shoes 4 the Shoeless! The 51 sponsored children of ARDR Allies took the opportunity to say thank you to ARDR Allies, during Laurent's July 2017 visit to ARDR, for their continuing education and health care. 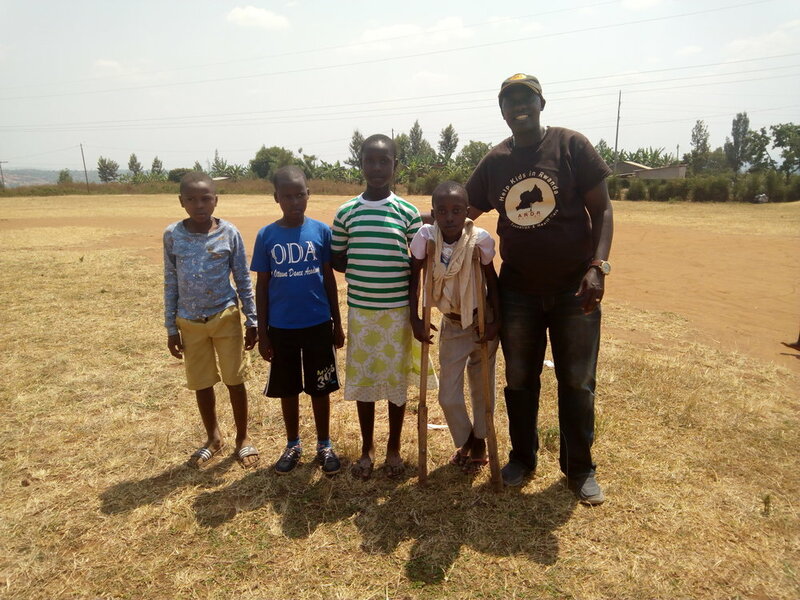 Laurent Muvunyi traveled to Rwamagana, Rwanda on July 18, 2017 for a three week trip to spend time with the 51 sponsored children of ARDR, assess the status of ARDR and to spend time with his parents who are in their 90's and have had recent health issues. A major highlight of his trip was a 'fun-day' that he planned for the sponsored kids in which they engaged in various activities. 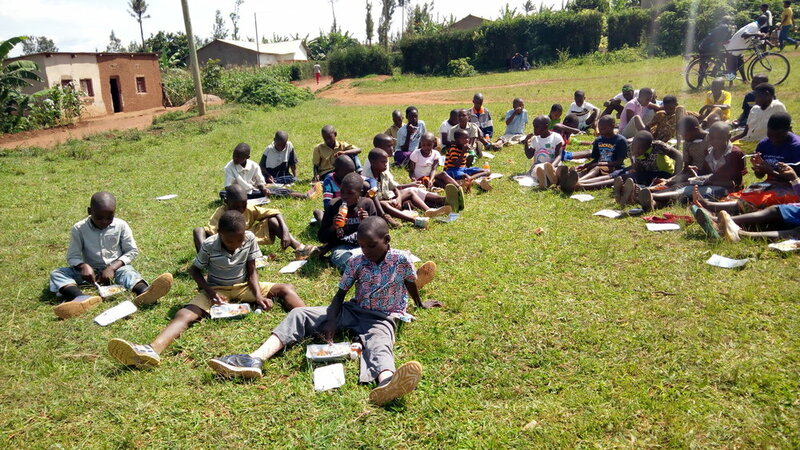 In addition to the normal 'fun-day' activities of various playground games, the kids also received a nutritious meal made possible by a private donation to ARDR Allies and a pair of socks and shoes provided to each sponsored child through a donation from Shoes 4 the Shoeless (of Dayton, Ohio). 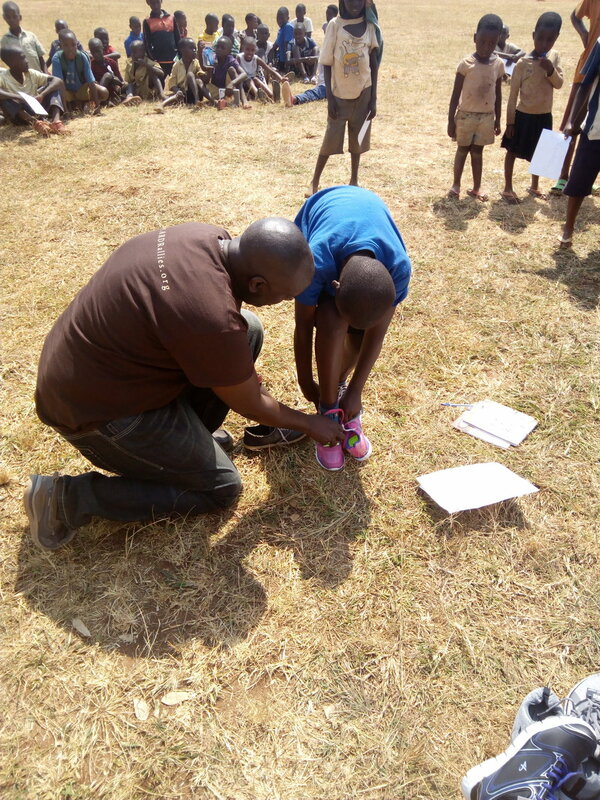 As a result, the children took time out of their day to thank Shoes 4 the Shoeless and ARDR Allies and write individual letters to their sponsors to thank them for providing their education and health care. 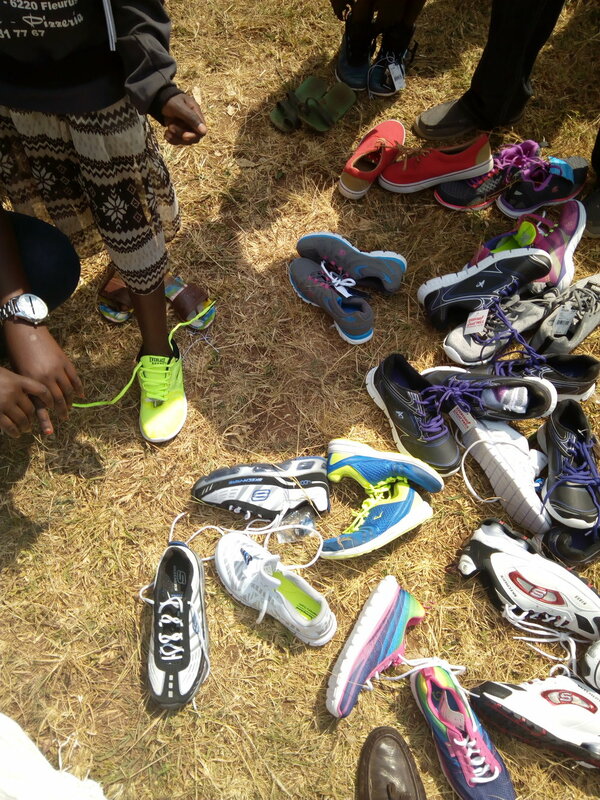 More detail on the distribution of the shoes, the shoutout to ARDR Allies and the letters to sponsors will be covered in separate posts. It took Ken Hamilton (ARDR Allies Treasurer & Secretary) and Laurent several hours to pack 51 pairs of socks and shoes in to a large suitcase and duffel bag the night before Laurent's trip and actually required the smaller shoes to be nested into the larger shoes. Donna Matheney, a long time ARDR Allies supporter, picked Laurent up and took him to the airport after she took the above picture. Providing Christmas dinner to the children of ARDR in Rwamagana gives them their biggest meal of the year...not to mention the fun activities which are also enjoyed on this special day. Therefore, when our provider of the annual dinner (LC Tudor) passed away in April 2016 we wondered if ARDR Allies would still be able to support the ARDR children with this annual Christmas feast. That is when ARDR Allies President, Laurent Muvunyi, put out a request on social media to solicit funds to continue this annual event. Fortunately a donor, who wishes to remain anonymous, stepped forward and provided the required support to once again make this a special day in the lives of these children. ARDR Allies lost a true friend and supporter of children when LC Tudor (age 77) passed away on Monday, April 11. LC provided Christmas dinner for the 380 children of ARDR during the past two years putting smiles on their faces and nourishment in their stomachs. LC knew that the children of ARDR only receive this type of feast once per year if someone provides a substantial donation. LC had become our regular "someone." He did not just support the children of ARDR, he supported kids around the world. When LC retired as an Advertising Manager he went to work for the Lebanon Children's Camp & Retreat Center and ultimately served as their Executive Director for 22 years. His special interests were The House of Blessings Orphanage in Calabasse, Haiti and the Christian Camp and Conference Association in the United States and St. Petersburg, Russia. He also taught Sunday school for 45 years and was a mentor to many youth. He leaves behind his wife Betty and two daughters, Lisa and Lynne and their families. LC was a special person with a heart of gold and ARDR Allies was blessed to be part of his life! The 5K Race for Rwanda has been canceled due to the low volume of participant signups. All racers and sponsors who previously committed will have their money refunded. Please bring your friends and family to the 2016 Race for Rwanda. We have three shelters reserved at the beautiful Patricia Allyn Park in Springboro, Ohio. So stay after the race, grill some hotdogs and enjoy the parks many amenities such as Frisbee golf, horseshoes, basketball, tennis, swing sets and try your luck at the catch and release pond. And it's all for a great cause! ARDR was once again blessed by the generosity of LC Tudor, Executive Director of Camp Lebanon Children's Camp & Retreat. This is LC's second consecutive year of donating funds to provide a Christmas feast for the 380 children of ARDR in Rwamagan, Rwanda. Christmas dinner, when funds are available from generous donors like LC, provide these children with their largest and most nutritious meal of the year. The kids set aside their daily chores and eat, drink and play games all day. However, Christmas 2015 was a bit different in that there was a wide spread malaria outbreak in December and many of the kids were too sick to attend in person and some of the kids who did attend were sick and unable to fully participate in all of the festivities (as can be seen in some of the pictures below). 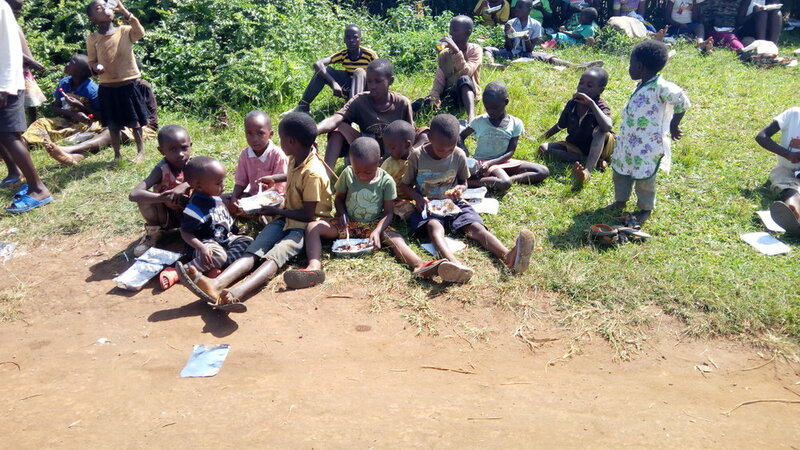 Jean Munyurangabo, Executive Director of ARDR said six of those children, who became sick during the dinner, were taken to the hospital and found to also have malaria. The Ministry of Health reported (according to Jean) that mosquito nets imported into Rwanda were inadequate to prevent mosquito bites and the resultant malaria. However Jean made sure that a generous portion of food was sent home with each orphan's caregiver to ensure the children who could not attend were well-fed from this feast. Jean wanted to pass along a special invitation to LC to attend the 2016 Christmas dinner to see how the Christmas feast positively impacts the kids. Thank you once again LC! ARDR Allies President, Laurent Muvunyi, received an opportunity to take his son Grant to a University of Dayton Basketball game on Saturday, December 5th. Since this would be Grant's first experience to attend a college game, Laurent took him to Flyer Spirit on Brown Street and purchased a Dayton Flyer sweatshirt to wear to the game. After all, he was going to be the Flyers' newest "6th Man" and had to look the part. Grant was so excited during the week prior to the game that he posted his best school performance year-to-date which was a pleasant surprise to mom and dad. Grant, who is six and in the first grade, was mesmerized by the UD Arena, the Flyer Faithful and the excitement of college basketball. And to make things even more special he had his picture taken with Santa Claus at the game. Grant sat on the edge of his seat intently watching the game while soaking up an experience that he will not soon forget. But who knows, some day, in the not to distant future, we may all be on the edge of our seats watching Grant knock down 3's at UD Arena. 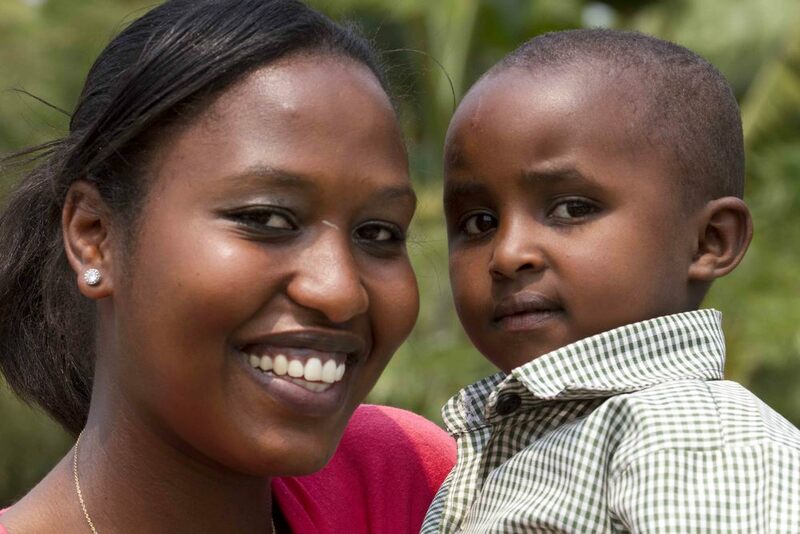 Mapendo (Nicole) Nandormana, wife of ARDR Allies President Laurent Muvunyi was separated from her mother (Dorkas Nyamukodwa) when she was two years old. The separation was caused by a second wave of attacks in the Congo which caused everyone to flee for their lives. Nicole and her two older siblings, (Francoise Bikundwa and Michael Mfashingabo happened to be with their father when they were forced to run for safety. Unfortunately Dorkas was not with them and when the killing stopped Nicole's mother and father each thought the other was dead. Sadly, as a result, everyone moved on with their lives. 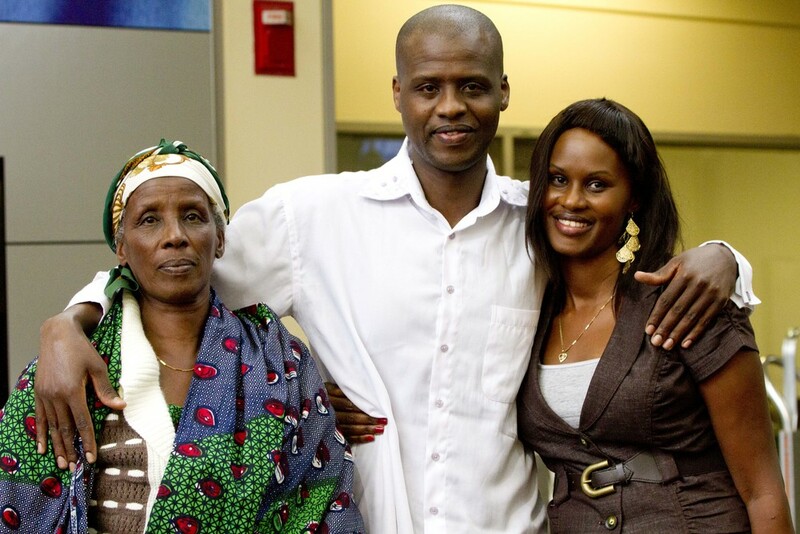 It was not until 18 years later in 2007 when Nicole was living in Maine and working at McDonalds that she called a friend in Burundi who told her that her mother was alive. Nicole was sure this could not be true but the friend insisted it was true and encouraged her to return home. 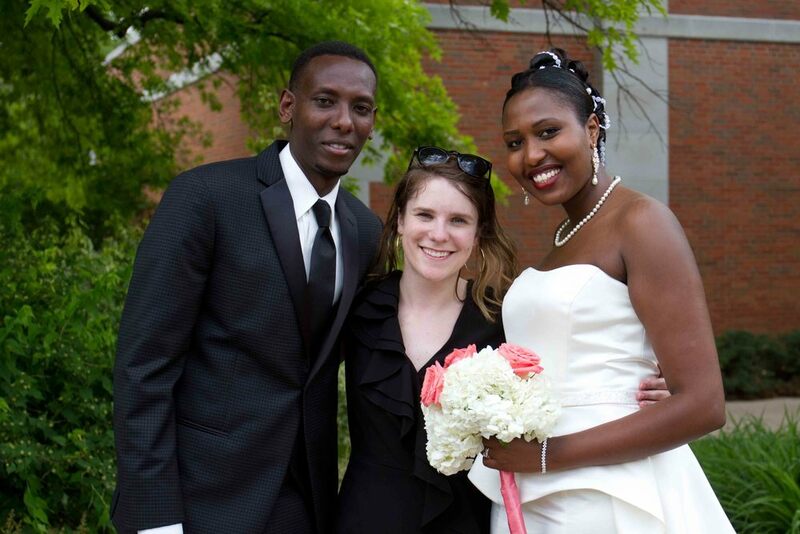 Nicole married Laurent in 2008 and in 2009, Nicole, Laurent and their five month old son Grant flew to Rwanda with two friends from Dayton (Sherri and Barbara) and ultimately met Dorkas who had been living in a Nairobi refugee camp since 2008. It was an emotional meeting for Nicole and Dorkas because by 2009 it had been twenty years since Dorkas held Nicole in her arms. 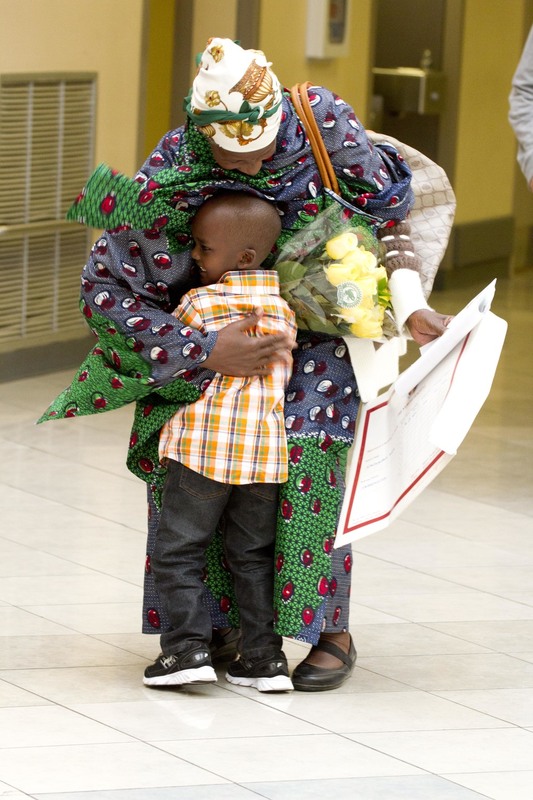 However this started a two year process of government interviews, paperwork and delays but culminated in a joyful reunion at the Dayton International Airport on May 26, 2013. In addition to Laurent, Nicole and their kids and Nicole's brother and his family there were approximately 40 other friends of Laurent and Nicole who came to celebrate this wonderful reunion. Life is different now for Dorkas. She lives on a different continent, she is experiencing running water for the first time in her life, nobody other than family can speak her language and she is trying to get used to snow in the winter. But she has reunited with her family. Laurent Muvunyi was contacted by the Dayton Daily News in November regarding an article they were preparing titled "Dayton's Role For Refugees Uncertain." The article was set to print during the height of discussion and tension among local leaders on the issue of whether Dayton should open its doors to the Syrian refugees. The article interviewed people from both sides of the issue and Laurent was asked to share his thoughts (see a clip from his interview below). Laurent has been extremely active with African immigrants since coming to Dayton approximately eight years ago. He 'knows the ropes' in Dayton having successfully settled with his wife and kids. Therefore, he is able to assist with language translation, getting people set up with home and auto insurance, etc. Laurent essentially knows who to contact and how to get things done in the Dayton area which is invaluable for his peers who are from Africa and new to the city. Laurent is a poster child for the "American Dream." He was an immigrant to the United States, got a job working for Montgomery County, bought a house where he and his wife Nicole raise their three kids (fourth on the way) and he became a U.S. citizen on August 15, 2013. 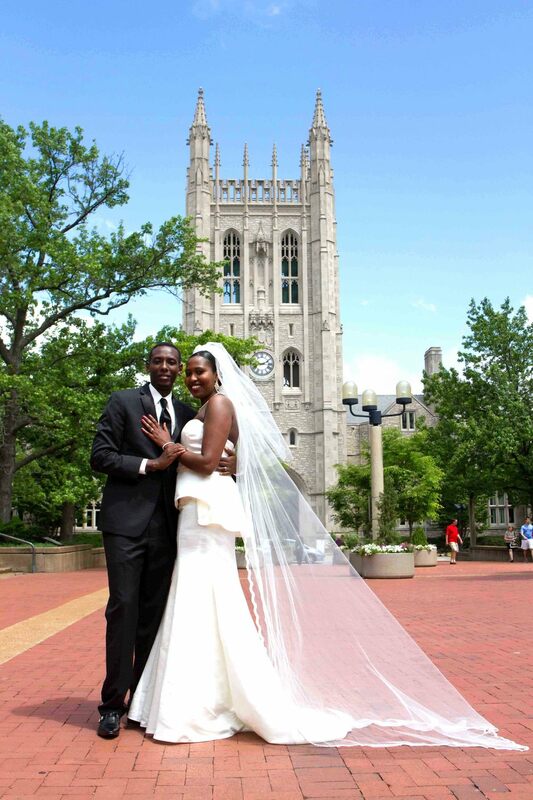 Dollard Mazimano married Clement Bagaza on May, 16, 2016 in Columbia Missouri. Dollard is ARDR Allies President Laurent Muvunyi's sister-in-law. Dollard was instrumental during the 2012 trip to Rwanda as she assisted with the kids picnic where we hosted the 380 children supported by ARDR with food, games and activities. However that trip also benefited Dollard because she met Clement during the same trip. Fast-forward to May 2016 for the big event which was attended by several 2012 Rwanda trip participants: Laurent Muvunyi, Ken Hamilton and Kara Hamilton. Ken was the trip leader in 2012 and Kara was the Chief Photographer and Activities Coordinator so it was like a trip reunion at the wedding. 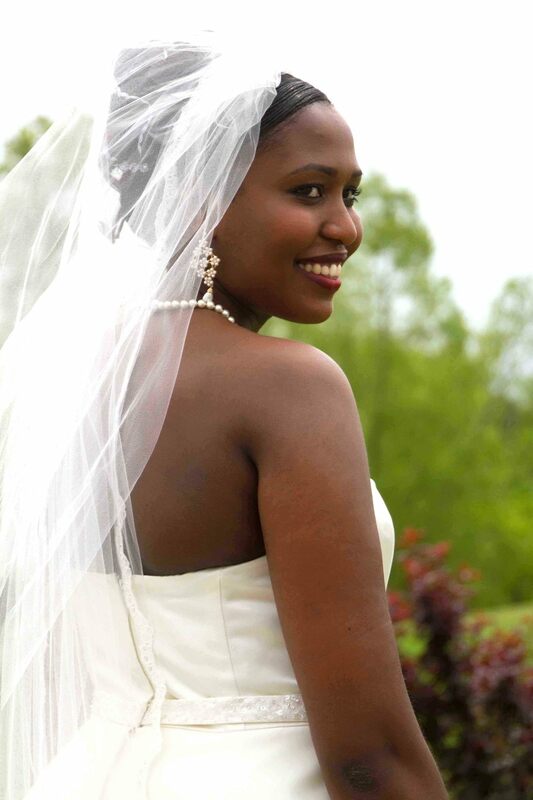 This was Ken and Kara's first Rwandan wedding and it was quite the experience. 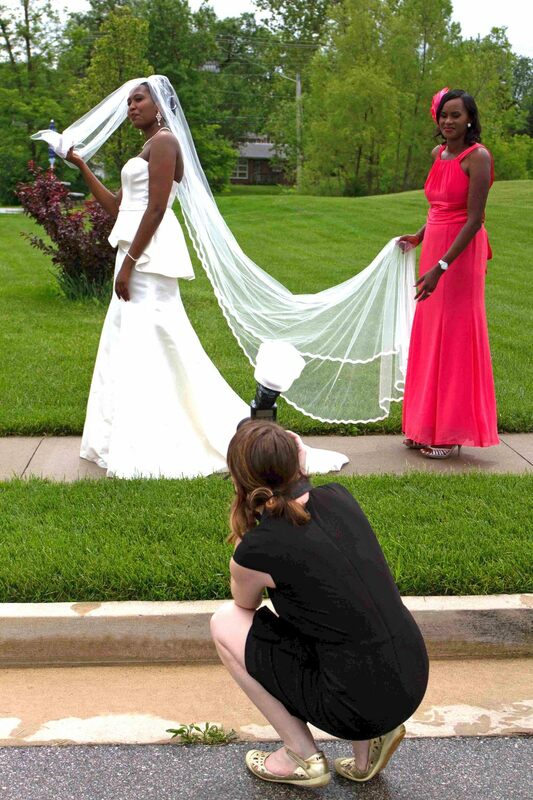 Not only did they attend the wedding but they ended up being the wedding photographers. It was a glorious event...all twelve hours of it, right down to the last cows that were gifted to the lucky couple. 3rd Annual "Race for Rwanda"
The 3rd annual 5k Race for Rwanda was held on Saturday, May 9th at Sugarcreek Metro Park in Bellbrook, Ohio. The primary purpose of the race is to raise awareness about the 1994 genocide which saw over 1 million men, women and children murdered within 90 days. The secondary purpose is to raise funds to help the people of Rwanda help themselves out of the poverty caused by the genocide. Laurent Muvunyi, president of ARDR Allies welcomed the participants prior to the race and told them how they are impacting the future of the ARDR children by supporting the event. After Laurent finished talking a small but enthusiastic group of runners and walkers took off through the beautiful trails of Sugarcreek. 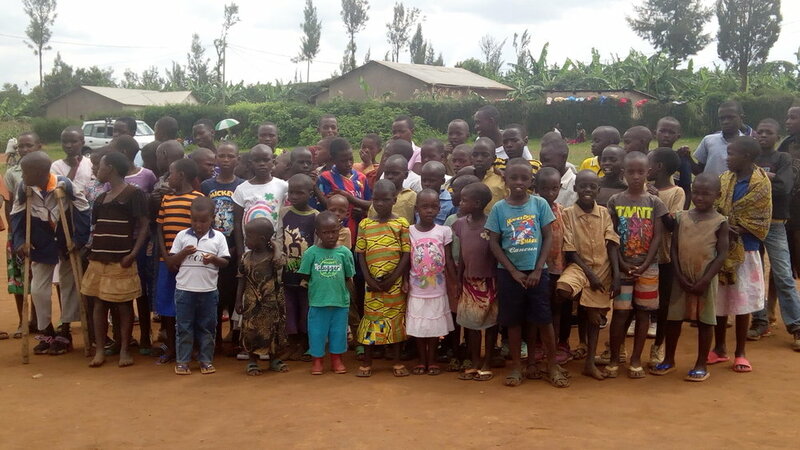 LC Tudor, Executive Director of Camp Lebanon Children's Camp & Retreat made a generous donation to ARDR Allies enabling Christmas dinner for the 380 children of ARDR in Rwamagana, Rwanda. LC's wonderful gift also supplied coloring books and crayons for the 51 sponsored children in ARDR. Providing Christmas dinner, when funds are available, gives these children the largest meal of the year that they will enjoy. ARDR singed a Memorandum of Understanding (MOU) with Independent Institute of Lay Adventist of Kigali (INILAK), a non-profit educational institution of Kigali, Rwanda on October 23, 2014. The purpose of the agreement is to build friendship and goodwill and foster a relationship that will support exchanges which promote meaningful civic engagement in a global context between ARDR and students, faculty members and administrators of INILAK. In an effort to internationalize our commitment to community engagement, both parties are now prepared to participate in a formal experiential learning program that seeks to promote opportunities for collaboration in service, internship and research efforts. Establishment of joint service and community development projects. Organization of joint research programs. Exchange of knowledge, ideas and training. Establishment of internships (local and abroad). Other service related programs to which both organizations agree. ARDR signed a Memorandum of Understanding (MOU) with the Rwamagana District, Eastern Province on October 8, 2014. The purpose of the agreement is to build friendship and goodwill and foster a relationship that will support exchanges which promote meaningful civic engagement in a global context between ARDR and Rwamagana District Hospital (which falls under the jurisdiction of the Rwamagana District). Organization of joint medical-related research programs to analyze and understand the health of the people in our individual organizations as well as the citizens of our community. Establishment of joint service and community wellness projects designed with the goal of improving the health of our citizens, which include, but are not limited to, physical examinations, immunizations, nutrition training, disease prevention, general hygiene and preventative care training as well as physical therapy and rehabilitation. Exchange of knowledge, ideas and training to improve the caliber and value of both organizations and our affiliates. Establishment of medical related internships (local and abroad). Other health care related programs to which both parties agree. ARDR Allies application for tax exempt status submitted on June 25, 2012 was approved on July 28, 2014. This entitles ARDR Allies to be exempt from Federal income tax under section 501 (c) (3) of the Internal Revenue Code retroactive to June 25, 2012. 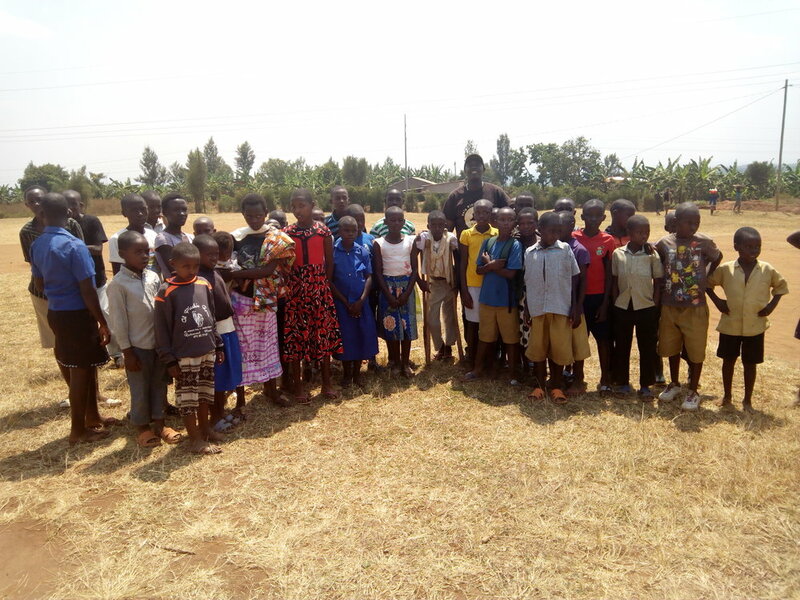 ARDR Allies President, Laurent Muvunyi, was recognized by Southminster Presbyterian Church in Centerville, Ohio in June 2014 for his ongoing effort to positively impact the lives of the children in Rwanda. The beautiful award was made by Jenny Miller and presented to Laurent by Jenny, Dorothy Fyffe and Pastor Eric Pasanchin (all pictured below).